In June 1940, the German army marched into an undefended Paris, signally the end of organised French military resistance and the beginning of the division and occupation of France. Many Jews, academics and artists had fled before the Nazis, but one man, the world’s most famous living artist at that time, decided to stay. Pablo Picasso (1881-1973) was unable to return to Spain because of his support of the Republicans in the Spanish Civil War, so he made the difficult decision to remain in Paris under occupation. But his status and talent were probably what saved him, even though the Nazis had branded him a ‘degenerate artist’. 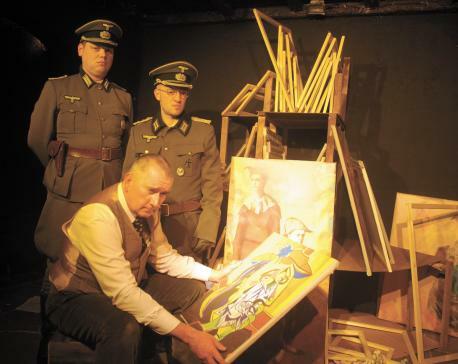 In September 1940, the artist was called to the Bank of Commerce and Industry in Paris, where he stored his paintings, by the German occupation authorities, to carry out an inventory of his work – and now a playwright from Watford picks up the story when Picasso is down in a bank vault with two Nazi officers. In Picasso’s Artful Occupation, Ian, 68, has the legendary artist playing the two German officers against each other in a bid to confuse and distract them, and convince them that his collection is worthless. “It must have been a strange existence,“ muses Ian, who retired from teaching 13 years ago to concentrate on his writing. “On the one hand, the Germans more or less left him alone to paint and it was an intensely creative period for him. But then I think he did suffer some privations – things like coal became very difficult to get.